This has been a long time coming but I’ve finally gotten around to writing the follow up to my Bleach: The Filler Free Viewing Guide and as it’s been requested the long running Shonen show I decided upon with be Hiro Mashima’s Fairy Tail. This will cover every episode of the anime produced to date meaning it will cover all 175 episodes of Fairy Tail Series 1 and what has been produced of Fairy Tail Series 2. There is a gap as Fairy Tail was cancelled mid arc for unknown reasons however rumor and speculation center around the belief that creator Hiro Mashima was a little apprehensive about the quality of the anime and the damage another prolonged filler arc could do to the series (manga included) and decided to pull the plug. However the series came back better then ever with a new director and new studio at the helm. Series Overview: Much like Bleach: The Filler Free Viewing Guide I’ll be dividing the episodes up by the North American DVD releases to keep what constitutes a “Season” as simple as possible. Due to the fact Series 2 hasn’t been released in North America yet I’ll just divide it in the standard 25 episodes for simplicities sake. Now that is out of the way, we turn to a simple question what is Fairy Tail? Fairy Tail is a shonen anime inspired by a manga of the same name focusing on wizards/mages from the titular guild Fairy Tail, where through the power of friendship and team work they battle an assortment of ever more powerful enemies. Acquiring new friends, new powers, and all that good shonen stuff we’ve all come to expect by now. So basically if you come in expecting something revolutionary you’ll be disappointed but if you come in expecting something familiar and surprisingly well done and at times even touching you’ll be in for a treat. Anyways here we go into the wild world of Fairy Tail! Fairy Tail “Season” 1 (Episodes 1-24): What one needs to remember as one watches the first few episodes of Fairy Tail is that it’s a slow burn in the sense the the first few episodes are actually not that good. At least they are certainly not as great when compared to the episodes that come later in the series. The first few episodes of this collection revolve around setting up the main characters, motivations, and basic backstory. Although the series is very adept at expanding the characters over time the introductions can still be considered important. Beyond that the collection starts with a series of mini-arcs which then move into substantial arcs. Although one could consider the “Lullaby Arc” the first true arc at only four episodes I personally don’t (with two episodes for wrap up one which is half anime original). Meaning the first real arc of the series is the “Galluna Island Arc”, it also starts the trends of backstories within main arcs. Although not great it’s a mark improvement over what had come before and shows the potential of the series in terms of both fights and story telling. The final batch of episodes then comes to “The Phantom Lord Arc” which is what I consider the first genuinely good Fairy Tail Arc. Filler Episodes: Episode 9 is partially derived from a couple Omakes but is mostly filler. Skip it. Episode 19, if you’ve ever seen Freaky Friday you basically know the plot of this episode although it can be funny, that said “Filler” one characters magic is shown for the first time in the franchise, in fact the character becomes so popular over time this plot is rectconned into the manga canon so we have a very weird example of non-filler filler... Episode 20, another Omake chapter. This is VERY important DO NOT SKIP IT, why will become apparent later. Fairy Tail “Season” 2 (Episode 25-48): The collection starts right where the last one left off right in the middle of “The Phantom Lord Arc”, which then transitions into the “Loke” mini-arc which massively changes the dynamics between two principal characters. Further in we move to “The Tower of Heaven Arc” which serves as Ezra Scarlett’s backstory (much like Galluna Island was for Grey and The Phantom Lord was for Lucy) and is a very fun action heavy arc. Finally the collection closes out with “The Battle of Fairy Tail” which even after hundreds of episodes produced remains my favorite arc within the entire series and focuses primarily on my favorite character in the series and has some of the best fights and transformations. Overall this is a very solid run of episodes that really shows how great Fairy Tail can be. Filler Episodes: Zero, none. Pure uncut Fairy Tail. 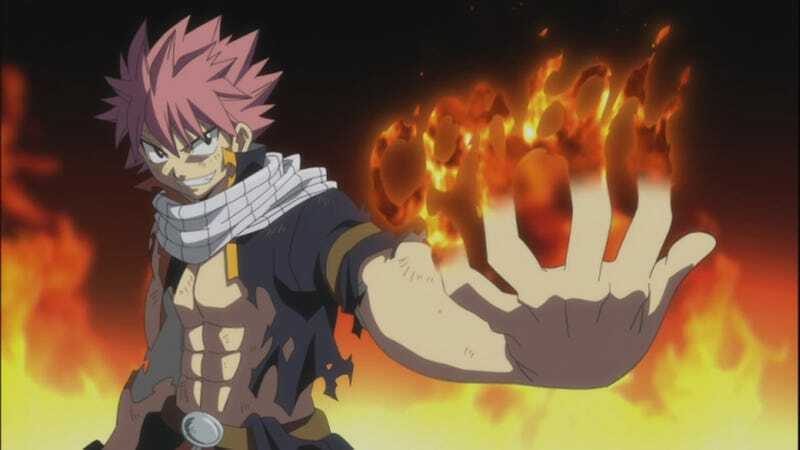 Fairy Tail “Season” 3 (Episodes 49-72): Starting off with two episodes of Filler which teases a new addition to the cast then starting with episode 51 the series transitions into the new “Oracion Seis Arc”. Interestingly the series kinda changes at this point, previous to this the show runners were working under the impression that the show would never move beyond “Fantasia” (Episode 48). 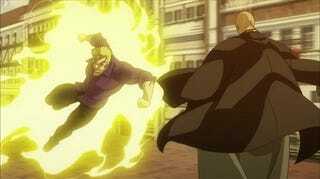 However due to the popularity of the manga and anime the show was continued leading to some changes in the production where it appears the pace of the arcs slows down and the rate of adaption of the manga slows down to the standard 2 chapters to one episode other shonen action shows follow. Making for both good and bad as the Orcacion Seis arc feel more meaty however the amount of padding to fill out run times REALLY becomes apparent at times. Filler Episodes: 69-72. Following the conclusion of the Oracion Seis arc the series moves into it’s first full on filler arc. The “Daphanie Arc”, to be honest I don’t remember much about this filler arc which really speaks to its quality I’d argue. It’s completely skipable just think this batch of episodes ends at 68. Fairy Tail “Season” 4 (Episodes 73-96): This collection continues with the filler arc from the last set up until episode 75. Following that the series movies to one of its more inventive arcs the “Edolas Arc”. Which involves members of the principle cast moving over to a parallel world and meeting alternative versions of themselves. Over all its another fun batch of episodes and washes out the bad taste left by the filler quite nicely. However compared to the manga its very padded with an entire almost completely pointless subplot added to fill out run time unfortunately it is unskippable as its woven into the main plot of the series. That being said the conclusion of this arc has one of the better payoffs in the series one that was teased back dozens of episodes before. Furthermore this serves as the “Backstory” arc for Happy and Charla. Fairy Tail “Season” 5 (Episodes 97-120): Continuing through without an interruption from filler Fairy Tail moves into its most ambitious arc of the series to date the “Tenrou Island Arc” which sees Fairy Tail doing battle with themselves and then a collection of the strongest enemies they have ever faced. 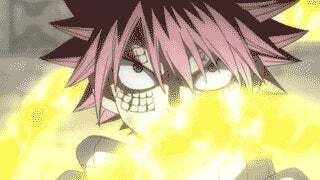 Really if the The Battle of Fairy Tail is my favorite arc this is without a doubt my second favorite. In many ways its representative of how to do a shonen arc right with the perfect amount of filler blended with canon material. Beyond that the entire arc is held together by a collection of some of the most elaborate and story shaping events of the series. Ending with the biggest cliff hanger in the series to date (well big enough). In short its a must watch for fans of Fairy Tail and really of the shonen genre, it’s just a lot of fun. Fairy Tail Collection 6 (Episodes 121-150): This set starts out by concluding the previous arc and really setting up the rest of the series. As following the large battle at the end of the last arc the main cast was frozen in time for seven years. So you know what that means TIME SKIP! Yup one of the classic tropes of Shonen Manga makes its first (and not last) examples here. However it’s kinda inverted instead of the heroes coming back stronger then ever they’re the same its everyone else who is stronger. Following that the series starting in Episode 125 moves into (you guessed it) a filler arc yay... Known as the “Key of the Starry Sky” arc this batch of filler is quite possibly the worst kind of filler. Annoying, pointless, reused characters, and WAY to long. Other then the few references later in the series showing it is “Canon” to the show there is almost nothing to recommend about these episodes. Fairy Tail “Season” 7 (Episodes 151-175): Well this is it the final “season” of Series 1. Following the filler arc we move into the “Final” arc of the series the “Grand Magic Games Arc”. This arc is basically a modified tournament arc which unlike in Dragonball’s individual tournaments are more akin to YuYu Hakusho’s team based ones. In it the various guilds from around the world complete to see who is the strongest Magic Guild in Fiore and in a series of magic battles and contest they must prove that. The entire arc is a sprawling one with multiple personal rivalries, love interests, returning characters, with brand new characters. In short the promise of this arc for a pay off is enormous. Sadly the series ended right in the middle of the arc following probably the second largest battle in the series up to that point. Fairy Tail Series 2 “Season 1” (1-25): Due to the fact Funimation hasn’t actually released these episodes yet (they are licensed) I’ll just be using the Japanese two cour standard of 25 episodes from now, also 25 is easy... Anyways due to the huge cliffhanger the previous series left off in it was pretty damn clear the series would be picking right up where it left off. With this in mind the new batch of episodes is far superior to what preceded it in that the pacing of events was sped up and all the potential I spoke of in the previous section is now finally realized. Not wanting to spoil anything but there is quite a bit of action and twists. Where to Watch: Crunchyroll. However Funimation has licensed the episodes so an English language release (if that’s your thing) will be coming out in time. Fairy Tail Series 2 “Season 2” (26-50): This season of episodes is various assortment of omake manga adaptations and a shortish (it felt longer...) filler arc. 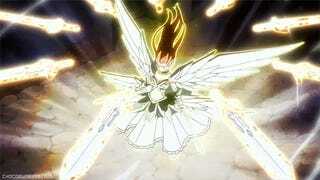 I refer to this arc as the “Celestial Spirit Rebellion Arc” because they totally ripped of Bleach’s on late series “Zanpakto Rebellion Arc” I’m not joking its the EXACT SAME CONCEPT even the hook of new and interesting character designs were copied... you can also call this Fairy Tail Braveheart because its all about FREEDOM! I may make fun of these but I expect the negative feelings I have with this arc is because I know what comes after it and every fan was REALLY looking forward to that arc. In many ways looking back it’d probably be relativly entertaining even if you watched it in a few sittings, so if you need filler do filler like this; short, to the point, and funny. Filler Episodes: Most of them the rest are humorous omakes which to those who haven’t read the chapters are indistinguishable from filler anyways... however to be fair some are quite funny and the final episode of the set starred my favorite character so bonus points for that. 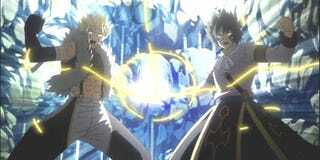 Fairy Tail Series 2 “Season 3” (51-Ongoing): Yay we’re caught up. This starts with a humorous omake episode entitled “Fairy Tail of the Dead... MEEEEN” and then moves into a recently concluded canon mini-arc that serves as little more then a set up for the next main arc of the series. Regardless the main attraction here is the extremely (well for a shonen manga about friendship...) dark “Tartaros Arc”. Without getting into spoiler territory more then I have already the Tartorus arc if adapted properly could be the best arc in the anime. We shall see. Conclusion: Fairy Tail both the manga and anime is actually my favorite shonen series going right now (Sorry Naruto...) and I’ve long been a proponent of it despite the anime’s glaring flaws. Overall its a very fun and light show that never takes itself to seriously. Unlike other shonen shows that have a way of losing its humor as the power levels rise Fairy Tail never has if anything it becomes even more pronounced. Even in some seriously dark scenes Fairy Tail finds the light, there is also quite a few “HELL YA!” scenes that I may have watched a dozen times just because they’re so good. In short while Fairy Tail may not be the most original thing in the world there are few long running shows that stay’s consistently entertaining. Grand Total Filler: For fun about 62 Filler Episodes of 240 Episode comes to 26% filler. Not bad, not bad at all.